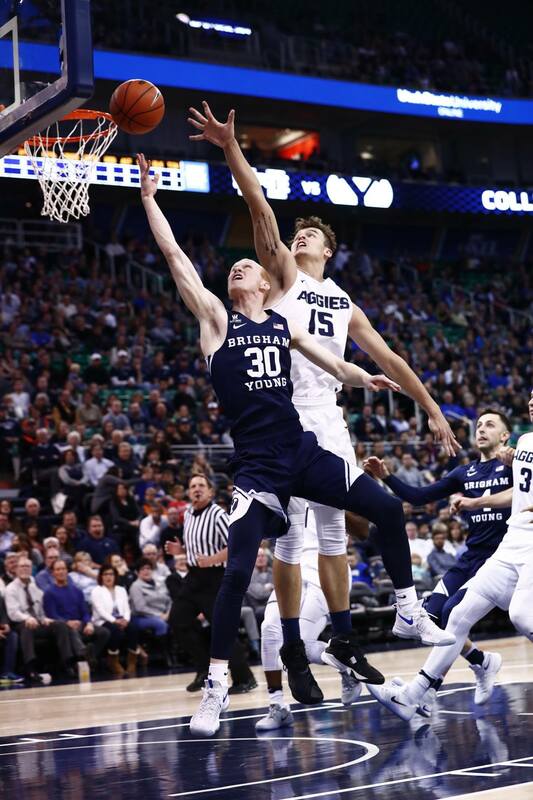 SALT LAKE CITY – Three Cougars posted career-high point totals as BYU topped Utah State 77-63 at the Vivint Smart Home Arena Wednesday night, ending a two-game Cougars losing skid. BYU has won five straight against the Aggies. Sophomore Eric Mika led BYU with 20 points and a career-high four blocks. Senior L.J. Rose recorded a career-high 18 points while pulling down nine rebounds. Braiden Shaw posted a career-high 10 points off the bench and Yoeli Childs added a career-high nine points and 12 rebounds to fuel the Cougars’ victory. 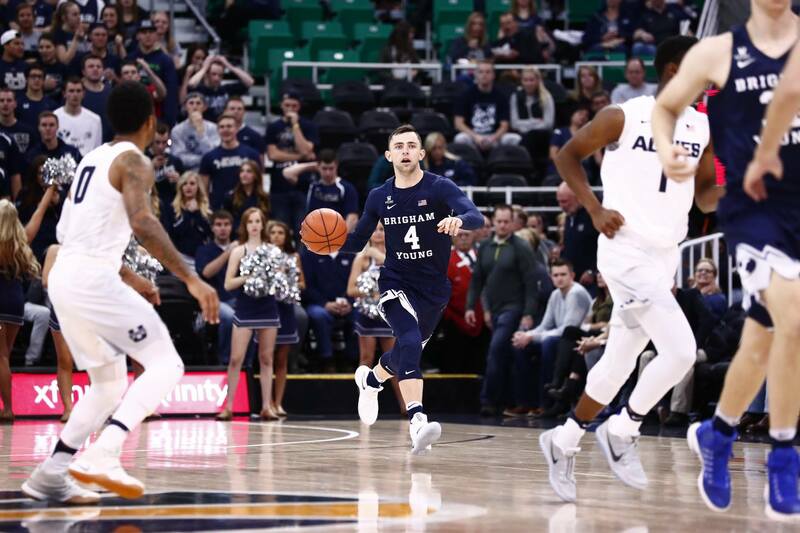 Despite Utah State (3-3) shooting more efficiently from the field and 3-point range, BYU (5-2) shot 85 percent from the free-throw line and out-rebounded the Aggies 55-31. Utah State scored the first five points before freshman TJ Haws put the Cougars on the board with a layup. Mika dunked off an over-the-shoulder pass from Rose to take the lead 6-5 with 16:50 left. BYU capitalized on the momentum as Davin Guinn and Jamal Aytes came off the bench to score on consecutive possessions. Nick Emery followed with a 3-pointer to give the Cougars their first double-digit advantage of the night, 21-11, and force a Utah State timeout with 11:45 to go. The Aggies worked to match BYU’s pace as Mika grabbed an offensive rebound to throw in a shot from under the basket to maintain the Cougars’ lead 27-18 with 7:55 on the clock. BYU went cold from the floor as Utah State’s 6-0 run cut the deficit to three. Mika broke the scoring drought on a jumper to put the Cougars back up 29-24 with five minutes left. Shaw converted four-straight shots off offensive rebounds as BYU fought to hold back the Aggies, entering the locker room with a 37-31 advantage. BYU struggled offensively at the beginning of the second half before Emery sparked the Cougars’ offense with 15:55 on the clock with a shot from the arc to extend the lead to six, 41-35. Rose scored six points for BYU before Mika dunked off a turnover for a 51-42 lead with 12:13 on the clock. Jalen Moore ended an Aggie three-minute scoring drought off an Emery turnover to put them back in play. Utah State continued to chip away at the lead and brought the game within five with nine minutes to go. Rose hit a deep shot from the corner to put the Cougars up 65-56 with 4:28 on the clock before the Aggies answered with a jump shot. BYU capitalized on Aggie foul trouble to cash in 12 Cougar points off free throws, seven coming from Rose, while closing out the game with the final score of 77-63. The Cougars hit the road in Los Angeles to play USC in the Staples Center in the Basketball Hall of Fame’s 2016 Hoophall on Saturday at 5 p.m. PST. The game will be broadcast on ESPNU and simulcast on Cougar IMG Sports Network, KSL 1160 AM/102.7 FM and BYU Radio – Sirius XM 143.